You’ve decided to start partner dancing. Congratulations!!! We love to dance and encourage any one who has the notion to get up and shake their tail feather. Here are some basic rules to get through and have a successful group class experience. Rule Number 1, the golden rule, when attending any dance group class: Be Humble. I don’t care if you competed at Blackpool, I don’t care if you are a jitter bug champ, be humble or get out of the rotation. You are not wanted here. Maintain your humility and you will get much more out of the group class then you ever thought. Added bonus people will like you more. No one likes a know it all. Rule Number 2: Show Respect. Make eye contact. Absolutely no eye rolling. Say, “Thank you.” after you dance with your partner. Unless the person you’ve found yourself dancing with is Hitler’s corpse, you will be polite and execute the step to the best of your ability with said partner. If the person that you are dancing with thinks that they know better than you and they are wrong, it doesn’t matter. Politely ask for the teacher to come over or be humble and let them get it wrong again with the next person in the rotation. Eventually they will figure it out, but respect their learning curve. 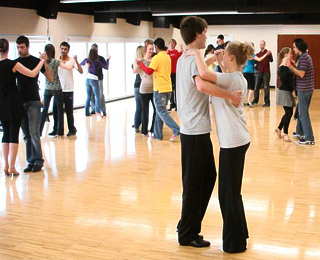 This entry was posted in ballroom, ballroom dance, dance, lindy hop, students, swing dance, teachers, teaching, Uncategorized and tagged Ballroom, Dance, Lindy Hop, Swing Dance. Bookmark the permalink.